The funds could be used to build 315 miles of border wall, a source said. The White House has directed the Army Corps of Engineers to find money is its own budget that could be used to fund the president’s desired border wall under a national emergency declaration, multiple sources familiar with the matter told ABC News. The White House has specifically asked the Army Corps of Engineers to examine what funds could be redirected to the border wall from a $13.9 billion February 2018 emergency supplemental that was designed to fund more than 50 disaster relief projects, including in California, Florida, Texas, and Puerto Rico, among other states, according to a congressional aide with knowledge of the matter. One U.S. official said the money could be used to build as much as 315 miles of border wall under the direction of the Army Corps of Engineers. The White House did not immediately respond to request for comment. President Donald Trump toured a portion of the southern border and visited with border patrol agents and local leaders in Texas on Thursday as he continued to make his case for a wall along the southern border to stop illegal immigration. His trip came on the Day 20 of a partial government shutdown triggered by the president's demand that Congress pay $5.7 billion for a border wall, which Democrats refuse to do. During a roundtable discussion at the border patrol station in McAllen, the president again contended – falsely – that he never said Mexico was going to provide a direct payment for a border wall and attempted to gloss over his past comments to the contrary by arguing he simply intended for the wall to be paid for through the revised NAFTA agreement. Asked how long he thought the shutdown could continue, the president wouldn’t offer a prediction but continued to dangle the possibility that he may declare a national emergency as a way to circumvent Congress. As he left Thursday morning to head to the border, Trump said he "probably ... I would almost say definitely" declare a national emergency to get funding for a border wall if he can't reach a deal with congressional Democrats. "I would say 100 percent," the president continued. "I don't want to say 100 percent because maybe something else comes up." While the president continues to say he'd rather make a deal with Congress, he again lashed out at Democrats over the current impasse, denied that he pounded on the Situation Room table and said he didn't "rant or rave" at the latest round of White House talks Wednesday before walking out. "I didn't raise my voice. That was a lie," Trump said. 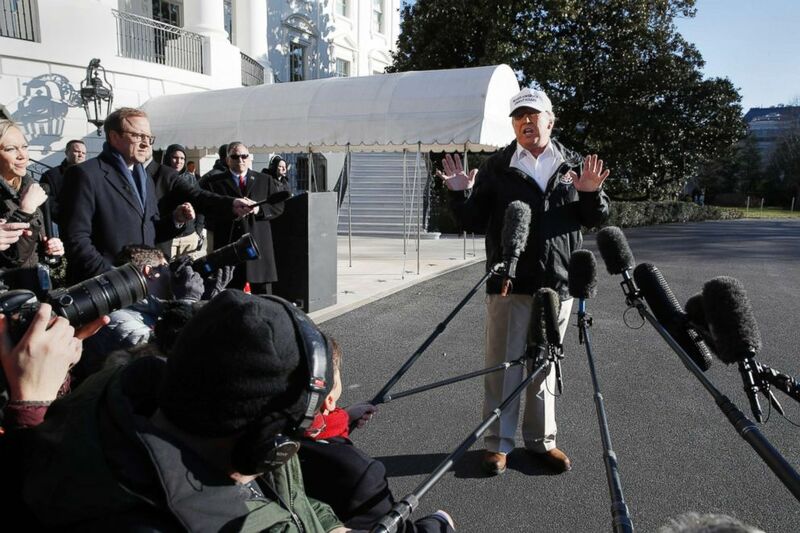 (Jacquelyn Martin/AP) President Donald Trump speaks to the media as he leaves the White House, Jan. 10, 2019, en route for a trip to the border in Texas as the government shutdown continues. "I don't have temper tantrums," the president said, pushing back on how Senate Minority Leader Chuck Schumer had characterized how Trump had acted when House Speaker Nancy Pelosi had again told him "no" when he asked whether Democrats would agree to wall funding if he re-opened the government. Pelosi challenged Trump’s desire to not only build a border wall but to end the partial government shutdown. Pelosi recapped her version of the “soap opera” atmosphere of negotiations with the White House, dubbing Trump as “unpresidential” in a meeting with congressional leaders on Wednesday afternoon when he walked out in protest of Democratic objections to building a border wall. Pelosi suggested Trump lied when he recounted his version of that exit to reporters, claiming that Democratic objections to “border security” more broadly prompted his premature departure. The president also said China was more "honorable" in negotiations than the Democrats. "We're negotiating and having tremendous success with China, and I find China, frankly, in many ways, to be far more honorable than Cryin' Chuck and Nancy. China is actually much easier to deal with than the opposition party," Trump said. Pelosi cracked the door open to cutting a deal through comprehensive immigration reform, even before the government reopens, but pointed to the president’s obsession with the border wall as an obstacle to negotiations on a broader agreement. Nevertheless, Pelosi said her aides have continued exploring options at the staff level with the White House, but charged the administration keeps changing its position. Pelosi said Democrats have offered to fund all the border security elements from the administration’s budgetary request for Homeland Security – excluding the wall. Also on Thursday, the president tweeted that he had canceled his trip to Davos, Switzerland, 11 days ahead, for the World Economic forum, blaming the shutdown -- and Democrats. The White House has said the president's trip to Texas, part of his PR blitz for a border wall, was designed to allow him to meet with those individuals who are "on the front lines" of what they have called a "national security and humanitarian crisis." He also made his way to the Rio Grande, the winding river separating the U.S. and Mexico. 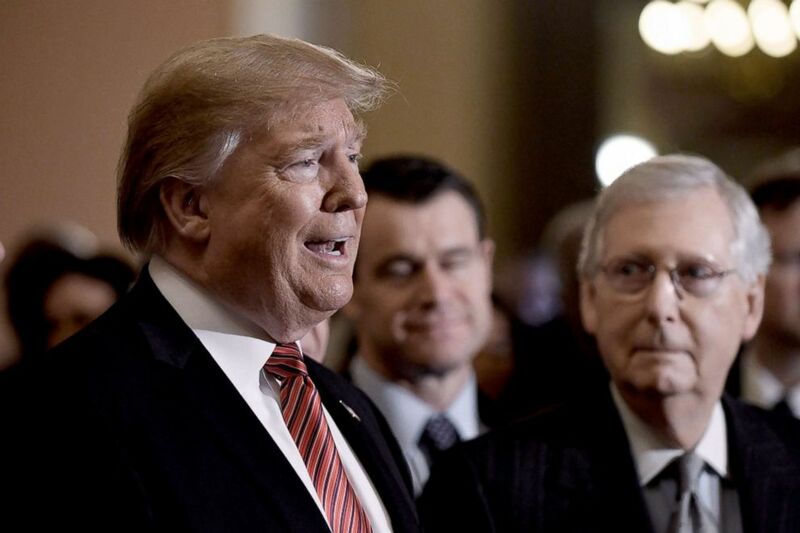 (Olivier Douliery/Getty Images) President Donald Trump talks to the press, as Senate Majority Leader Mitch McConnell looks on, after the Republican luncheon at the U.S. Capitol, Jan. 9, 2019, in Washington, DC. Whether the president has the legal authority to build a wall by declaring a national emergency -- in which he would circumvent Congress to get military funding for the project -- was under review by White House lawyers, but Trump said he had the power to do so. "The lawyers have so advised me," Trump said. "I'm not prepared to do that yet, but if I have to, I will. I have no doubt about it, I will. I have the absolute right to declare," Trump said. Later, he added he has a "tremendous" amount of funds available if he chooses that route. Pelosi refused to tip her hand regarding how the House may react if Trump declares a national emergency to build the wall without congressional approval, but she expressed doubt that congressional Republicans would be satisfied if the president took executive action to circumvent Congress. Should the president go forward with the move, it would almost certainly be challenged in court. The White House has struggled to make the case that there is, in fact, a crisis at the border, with the number of illegal apprehensions trending downward over the last two decades. But the administration points to an uptick of illegal border crossing apprehensions in recent months as evidence. ABC News' Meridith McGraw and John Parkinson contributed to this report.